Memorial services are scheduled for 10 a.m. Saturday, Nov. 4, at the Eddy County Fairgrounds Community Building for Daniel C. Juarez of Artesia. Juarez, 93, passed away Monday, Oct. 30, 2017. Frank Barrera will officiate the services. Daniel was born Nov. 23, 1923, to Ralph and Pabla Chavez. He was a member of the armed forces and served as a tail gunner in a B-17 bomber from 1942-45 in World War II. On July 20, 1946, he married Catalina Corona. Daniel worked as a car painter for Artesia Ford. He then became employed by Navajo Refining Co., where he worked for 27 years until his retirement. He was an avid fisherman who loved going on family vacations. Survivors include daughter Kathy Caraveo; sons Manuel “Danny” Juarez and wife MaryLou, and David Juarez and wife Debbie; brother Bricky Juarez and wife Stella; sister Virginia French of El Paso, Texas; 18 grandchildren; 48 great-grandchildren; 10 great-great-grandchildren; and numerous nieces, nephews and cousins. 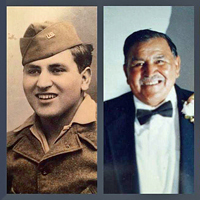 He was preceded in death by his parents; brothers Raul “Dooley” Juarez and Cruz Juarez; sisters Rachel Analla, Lucy Rascon, Mary Utterback and Lola Barrera; son-in-law Octaveo Caraveo; and granddaughter Cori Caraveo Granado.